September 02, 2012 • Heidi Shenk • "south dakota" • "travel"
I have left you high and dry, readers. I will be the first to admit it. The school year is upon us and the last week has been incredibly hectic getting back into routines. I plan to continue my travel posts from our road trip this summer and I have a few other posts in store as well in the coming week. However, you may see me less frequently in this neck of the woods until summer vacation arrives again. 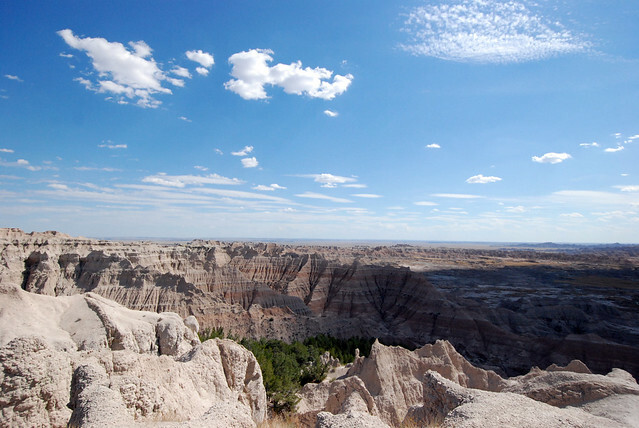 Our next stop on our road trip after visiting the Badlands was The Black Hills. We decided to stay in Custer State Park upon recommendation by my mom, and we were not disappointed. The park was absolutely huge and had so many adventures to offer. We spent one day hiking several of the park's beautiful trails up through rock formations that were most incredible. When we had pictured the Black Hills before our arrival, we certainly hadn't expected what we found. And even more flabbergasting was how quickly the land had changed from the Badlands to a rocky and forested terrain of this magnitude within a short two hour drive. On our second day, we were able to take side trips to see Mount Rushmore and Crazy Horse as well as enjoy some more beautiful scenery and hiking in Custer State Park. The only thing that we didn't love about Custer State Park was the fact that there was a fire ban, so we were unable to have a campfire at our site in the evening. But when you consider the drought conditions of the area, you couldn't complain about it and you felt pretty lucky that the forest was still standing. Point being, this segment of our trip was phenomenal. There was one other thing that made this portion of the trip special. Ten years ago I traveled through the Black Hills with my parents on a similar road trip. During our time in the Black Hills I had violent food poisoning. It was so bad that I can hardly remember what happened during that part of our trip. I remember driving through those winding roads in the Black Hills, being horribly sick, staying in some random hotel for the night and waking up the next morning being able to choke down a small piece of toast. I think we also saw Mount Rushmore in there somewhere, but I don't remember much of anything because the food poisoning was so bad I had practically blacked out. It may be silly, but as we drove out of Custer State Park to head onward to Yellowstone, I pumped my fist in the air and yelled, "I did it! I conquered the Black Hills without getting food poisoning! Woohoo!" Andrew looked at me as though I had lost my marbles, but I was glad to say that this time I could enjoy this part of our trip, unlike ten years ago. August 16, 2012 • Heidi Shenk • "badlands" • "south dakota" • "travel" • "wildlife"
If there is one thing that was reiterated on this road trip yet again, it was that South Dakota is actually a pretty amazing state. Never thought I'd say that, huh? Not something you hear on a regular basis, but I'm sticking with it because our time there was phenomenal. Andrew couldn't stop commenting on the diversity of the land within just one state, and he is spot on about that one. Don't understand the pun in this post's title, just keep reading. After our stay in Indiana, our first stop was an overnight in Sioux Falls, South Dakota. We had made great time in driving so we had a few extra hours to spare after we checked into our hotel. What was meant to be just an overnight place to sleep before we moved on turned into a fantastic side adventure. We found the main park in Sioux Falls which was indeed the falls of the Big Sioux River and also home of the ruins of the Queen Bee Mill. It was the perfect place to take a walk and enjoy being outside after being stuck in the car all day. We then set out to find a place to eat. We were surprised by the downtown revival that was happening in Sioux Falls and there were plenty of fabulous looking restaurants to choose from-- not at all what we were expecting! We found a place called JL Beers which seems to be a very small local South Dakota franchise. We had great burgers and got the chance to try a flight of beer that included all beer from Montana, Wyoming, South Dakota and the like-- nothing that we'd had before. The next morning, we moved onward. 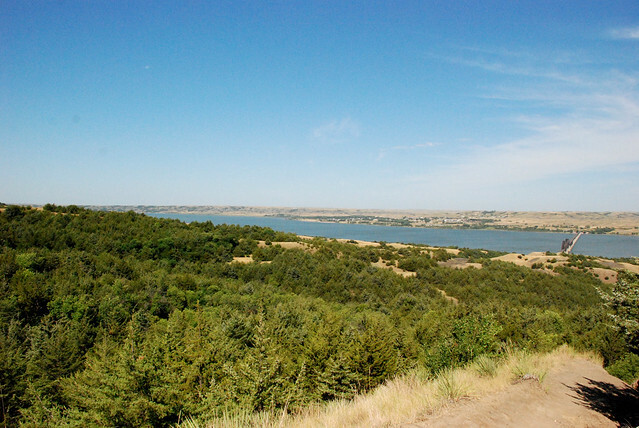 We stopped briefly at a Missouri River overlook near Chamberlain, South Dakota before moving on to our first National Park stop. As we drove toward Badlands National Park, we were greeted by flatter grasslands. Seeing the arrival of the Badlands is incredible. The Badlands have been formed over years of erosion where a lake bed once nested. As you arrive, you're amidst grasslands and suddenly see a huge drop in the land where the Badlands are carved out. We spent about two hours hiking on two separate trails, but spent the rest of the day on a scenic drive through the park, stopping at points of interest. Having been here three times now, I have to admit that this is the only way to do the park and survive. 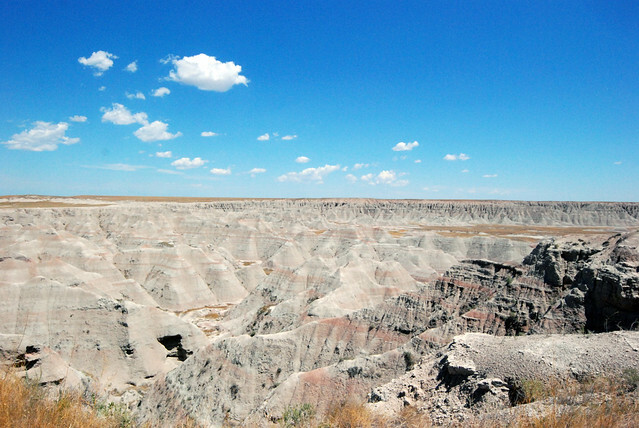 They aren't called the Badlands for any old reason-- they're truly bad. And on the day we visited, it was a whopping 107 degrees. I am still in awe of how harsh this land is and how immense its formations are. Just take this photo for example-- can you spot Andrew on our hike? The change of colors and shapes within the formations are incredible as well. We also had our first wildlife sightings in the Badlands. Last time I had visited I was lucky to spot two big horn sheep climbing in the craggy rock in the distance, but this time we were even luckier to see a group of them munching on the grass by the side of the road. And there were lots of little baby big horns too! Andrew spotted a bison in the distance-- the first he'd ever seen in the wild (I'll save the bison photos for Yellowstone as we have a pretty fantastic story to go along with the bison we saw there). 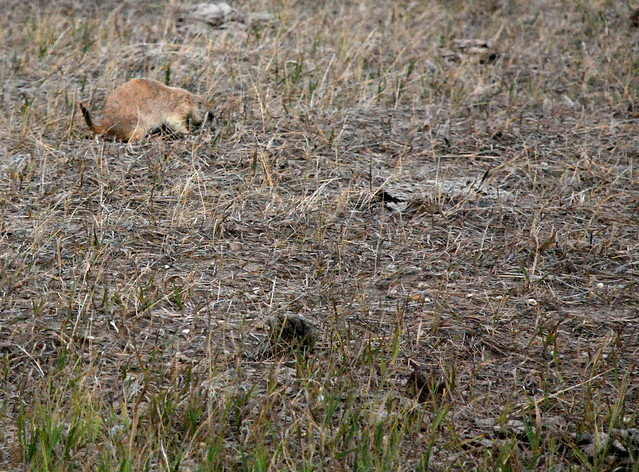 And of course, the prairie dogs were everywhere. True story-- there is a reason for the Bruce Hornsby song Prairie Dog Town. Only someone who has visited the Badlands would fully understand. Needless to say, after our Badlands adventure we headed on to the beautiful Black Hills of South Dakota. More on that next!